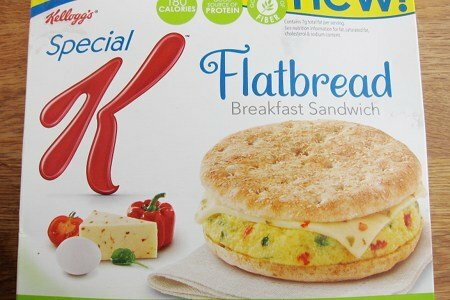 The New Special K Breakfast Sandwich: Friend or Foe? Snack Girl purchased this box of sandwiches for $6 because she had seen so many commercials for this product. Also, a reader e-mailed asking me what I thought of them, so I thought I would give them a try. Wouldn't it be great? An easy, microwavable, healthy sandwich to start my day. My first problem with these was the price. At $1.50 each, these better be good! Okayyyyy. What are rye nuggets and will I like them? This seems more like a chemistry experiment than food. 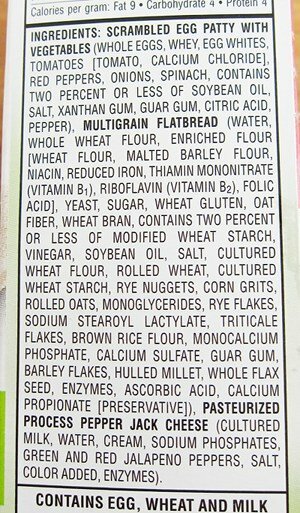 The multigrain flatbread part of the list is really out of control. This is feeling like one of those processed foods we should avoid, even if it is low in calories and trying to be healthy. How did it taste? In all of my years doing this job (4 years), I have never tasted something so terrible. Usually, I buy something like this and it is “okay”. This was inedible. The eggs were watery and too salty. It was like eating a watery, salty, spongy, ball of clay. It did not resemble breakfast and under no circumstances do I recommend it. How Kellogg's could mess up bread, eggs, vegetables, and cheese is beyond me, but they did. I promoted my own breakfast sandwich last year. Check it out here: The Egg McMuffin Makeover and give it a try. Almost anything you make in your kitchen will be better than the Special K breakfast sandwich. Healthy & Sustainable Fish at McDonald’s? It is beyond me why people would buy something like this when you could make it probably in the same time it takes you to heat this up. Thanks for letting people know though that they should not buy this product. Love your egg McMuffin. Thanks Snack Girl for saving me time, taste and money. I've been looking for these and haven't been able to find them locally. Now I can stop looking. My Friend at work eats these everyday. She gets the one with ham or bacon and it's 280 calories for one sandwich and I don't recall but the nutritional stats were not great on that one either! Love your post today! I think I will make my own sandwich! Thanks for doing a review on these...I too was tempted to buy them, but kept forgetting...Now I can forget and not worry about them. Thanks for your hard work and keeping us from having to try them! Thanks so much, Snack Girl, for giving me an advanced warning on this breakfast sandwich. I love getting the emails from you!! You have saved me so much money that I would have spent on food that would have been trashed. Keep all the notices coming!! I make an eggbeater with spinach, 1/8 c. lowfat shredded cheese, and a mushroomon on a whole wheat Smart tortilla for 3 points and it is delicious! Most mornings I eat two real eggs on a 100 calorie Arnold's flatbread (whole wheat) with spicy mustard. I season the eggs with Mrs. Dash. For 245 calories I have a healthy protien packed breakfast that holds me until my mid-morning snack of Chobani. Quick to make and so much cheaper. Glad you tried them - I thought about buying for a quick breakfast; but now I won't. I'll stick to the Thin Bagels by Thomas' with a slice or two of low-sodium turkey and a slice of Sagento's low fat cheese with a couple of squirts of Dijon Mustard - I can eat them cold or heat them quickly up in the microwave - filling and delicious.. Thank you for the post and the blog, I am enjoying your work!!!! As for the "food" review, I just follow the axiom "If it comes out of a box or can, don't eat it!". Of course there's no comparison between a homemade sandwich and a frozen one. These are much better than a competitor's light breakfast sandwich, and I do buy them sometimes and have them with a salad for a quick lunch. I have been making a batch of egg muffins which I keep in the frig and nuke for 30 sec on work mornings. Super easy (eggs, milk, cheese and whatever veggies you like), no processed garbage and less expensive too! OH NO!! I was hoping you liked these. I like the egg,turkey sausage, and cheese sandwiches and they are good on points for me. I have never tried the kind you discussing so I'm hoping its the choice not the product overall that has turned you off. Thank you for taking the hit for all of and testing them. I had planned to and am glad I didn't make the mistake. Thank you Snack Girl!! You're saving lots of people from being disappointed and lack of taste and flavor as well as keeping more money in their pocket books by reviewing this product. I, too had purchased this several months ago and was beyond sad that something I thought would be so wonderful would truly be so indelible. Thank you for reaching the masses and helping us all try to be healthier and enjoy food! Good, tasty food that is healthy! I picked them up and hated them. Tasted like "bad" cardboard with mushy egg in the middle. However, my teenage son actually loved them -- until I pointed out the sodium content. He is now back to his old standby - cereal. Whew, I had these in my hand at the store and debated buying them. Not sure why but I passed. Gald I did. I make my own breakfast with one egg + egg whites on flatbread or a whole wheat tortilla. I precook mushrooms and spinach to add for flavor. I always feel good about tphaving this breakfast. I haven't figured out the cost but the nutricinal value is pretty good. Thanks for the review, glad I never bought them. I make my own breakfast sandwich at home from a recipe I found on Slender Kitchen, can't wait to try your recipe out too. I fry up an egg (beat it a bit first) and put it on a toasted English muffin. It's only 5 points+ values and really yummy. Oh, and I put some ketchup on top - 0 ppv!). I don't care for the SmartOnes version of the egg mcmuffin either! I'd much rather make my own. So easy and good!